Take piano lessons in the comfort of your own home - no matter where in the world you live! 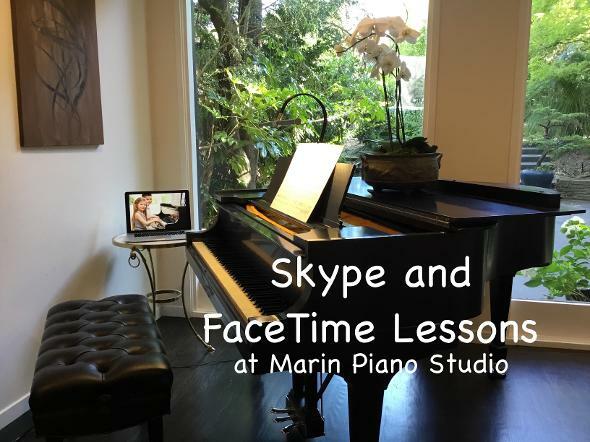 Marin Piano Studio offers internet lessons, through Skype™ and FaceTime™. Personalized piano, music theory, and music history instruction is available worldwide. Perfect for students who live in an area with no easy access to an instructor, those who are housebound, or those who lead a busy lifestyle! Your lessons are scheduled at a mutually convenient time, and are just as effective as in-person lessons. Just like in-person lessons, they are matched to your particular needs and desires, whether it be to play classical, pop, or a particular piece of music you want to learn. Along with your weekly, private Skype or FaceTime lesson, an additional 10 minute, private "mini lesson" may be scheduled mid-week to keep you progressing very quickly. How does it Work? Email the instructor to notify her of your interest in Internet lessons. She will arrange a free test call with you. During this first call (which usually lasts between 15-20 minutes), she will ask you about your interests and goals as they relate to piano and music. You will also make sure that the connection is good, and all of the technical aspects, such as camera positioning, are taken care of. Afterward, once you have agreed to a mutually convenient time for the lessons, and she has received payment, Mrs. McLean will call you, and lessons begin. How do I make payments? If you live within the United States, you can set payments up on the bill payment option of your local bank, or use a PayPal™ subscription. The instructor will provide you with the payment address after your initial meeting. If you do not use bill payment, personal checks drawn in a U.S bank in U.S. currency are also accepted. Payment is due at the beginning of each month, for the upcoming month. Please contact the instructor for current rates. If you live outside the United States, you may use money transfers into a bank account, or you may pay via PayPal™. How can I best position my phone or computer camera? This is something that will be covered during your first meeting. Generally speaking, a clear view of the entire keyboard is needed. The instructor will need to see your hands, not your entire body most of the time. The camera can be positioned either to your right or your left, and should be about 4 feet from the ground. A bar stool, or a similarly high platform, sometimes aided by a stack of books, usually works great. How much does it cost? Tuition varies depending upon time of the lesson, student level, and duration of the session. Please contact the instructor for more information. Please note that neither Mrs. McLean, nor Marin Piano Studio, are in any way associated with Skype™ Inc., FaceTime™, Inc. or Paypal™, Inc.